Whether you’re hosting friends or family for a special occasion, the holidays, or even a surprise visit, you want to have a comfortable guest bedroom where they can relax and recharge. The guest bedroom should be a home away from home for your visitors, not a room of cast-off furniture and old junk. Odds are, you can think of a time when you were staying with friends and family and found yourself sleeping on an old, rock-hard bed or a saggy air mattress – as happy as you might be to see your hosts, it can be tough to endure several nights of uncomfortable sleep. For many of us, the main spaces in our home like the living room, kitchen, and master bedroom are the focus of our attention when decorating and purchasing high-quality pieces. But it’s important to not forget about the guest space. When it comes time to shop for your guest bedroom, you’ll want to consider elements like a comfortable bed, high-quality bed linens, and thoughtful accents that show your guests you care. Here is a helpful shopping guide with questions you should keep in mind when searching for items to make your guest bedroom the perfect place to welcome friends and family. Does my guest room have a comfortable, high-quality mattress? Everyone can agree that they want their guests to be comfortable and providing them with a good mattress is the most important thing you can do to achieve this. However, it can be tricky to buy a bed for someone else, especially if you don’t know their sleep styles or preferences. Here is a simple mattress buying guide that can help you buy one that works for all of your different guests. Who will be using the room most often? When you’re choosing a mattress, consider the visitors that will use the space most often. Don’t choose a mattress based on your distant cousins that only show up once every ten years; instead, pick something that your parents will be comfortable with during their twice-yearly visits. How large is the guest room? Typically, a queen-sized mattress is the most popular option when it comes to guest rooms, providing guests with enough space to sleep comfortably without feeling cramped. However, if space is limited, you may want to purchase a full-sized mattress instead. What are the basic qualities of a good mattress? Whether you’re choosing a mattress for yourself or a guest, the basic formula is still the same: find something with a balance of firmness and softness, providing comfort and quality support. Where can I buy a good mattress? When you’re considering where to buy a mattress, stick with stores that offer premium brands, not cheap knock-offs. The store should have a knowledgeable staff that is focused on helping you find the right option, not simply making a sale. Does my guest room have a couple of sets of excellent bed linens? Don’t limit your guests to old, faded sheets that you don’t even use anymore. Purchase comfortable, high-quality sheets that will show them that you care about their comfort. Bamboo sheets are an excellent option because they are comfortable, breathable, and naturally antibacterial. 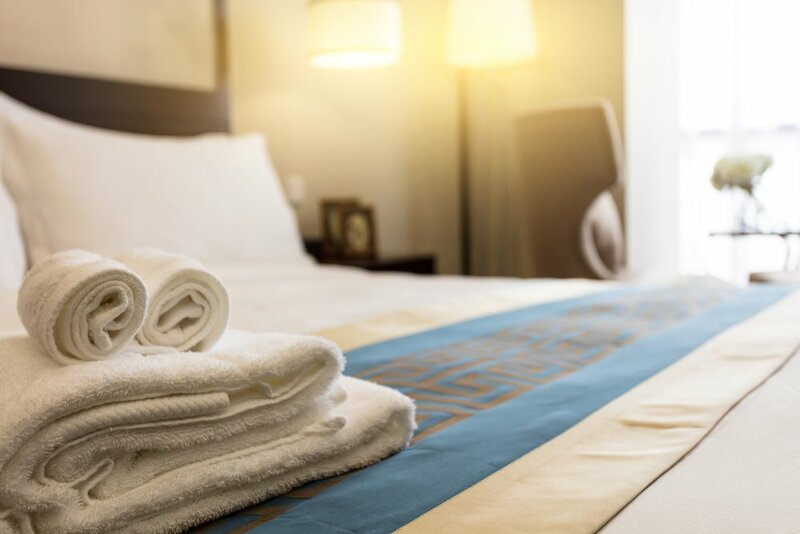 If you have guests that typically stay for several days at a time, purchase an extra set or two of sheets, so they can have fresh linens without having to deal with laundry. Is there a variety of pillows provided for my guests? A pillow is one of the most important parts of a good night’s sleep, but they aren’t a one-size-fits-all product. Depending on if your guests sleep on their side, back, or stomach, they will require different pillow types to provide proper support. It’s a good idea to purchase several different pillows and provide your guests with options. They’ll appreciate being able to choose something that works for them, and you can be happy knowing that they are enjoying a good night’s sleep. Is the room set up for comfort and convenience? Once you have a comfortable sleep setting established for your visitors, turn your attention to small details that can make space feel like home. Add a small side table next to the bed, providing a space for their phone, glasses, and anything else they want within arm’s reach. Guests will also appreciate a small wall mirror, so they can check their appearance before heading out into the main space. Hopefully, you are feeling ready to tackle the task of creating a cozy, welcoming guest room for your friends and family to enjoy. With this handy shopping guide, you have everything you need to get started. At MATTRESS360, we are more than happy to be your partner in creating a wonderful guest space and can help you choose essentials like a high-quality mattress, comfortable pillows, and cozy linens that your guests will love. Thanks to our unbeatable prices, flexible financing, and an extensive selection of premium sleep essentials, we are the best place to buy a mattress and any other sleep products you may need. Visit your local MATTRESS360 in Glendale, AZ or request a free quote today and transform your guest room into a comfortable retreat for all of your visitors.